For better or worse, it finally feels like this season of Revenge is settling into a rhythm. Most of this is due to what feels like a paring down of the insanely complicated central Initiative mystery that kicked into high gear with the first season finale and quickly spiraled into almost incomprehensible nonsense within the first few episodes of season two. It’s still fairly unclear what’s happening—and the show still needs to solidify why we should care—but with the emergence of Helen Crowley as an actual living, breathing bad guy to symbolize the organization, it feels like the show is finally finding a way to make the byzantine story work. The most welcome thing about Revenge’s return, however, was the return of the “revenge procedural” element and Emily’s red pen of doom, something that’s been sorely missing this season thus far. It’s a juicy one, too, as it’s revealed the Graysons weren’t the only completely corrupt people surrounding the David Clarke trial. Perhaps even more to blame was David’s trial judge, Robert Barnes, who suppressed evidence of a tainted jury in order to ensure he would have a pristine record for the high-profile trial. Luckily for Emily, the judge is a close friend of the Graysons and now in line to be the next Supreme Court justice, making him ripe for the revenge picking. What’s interesting about this particular case is it doesn’t feel as specifically planned out as some of Emily’s revenge schemes from the past. All information she uses to take him down—that he was abusive to his wife, and that she was the one who wrote the letter incriminating him—is illuminated once she gets the opportunity to cross paths with him. After a season of watching Emily play the too-long con, it’s nice to see her put information together and execute a plan on the fly again. Also interesting about this case is that when the wife reveals her husband’s treachery, she does it in front of a gaggle of press, who could easily inject some doubt in public opinion about the status of David Clarke’s guilt. Is this the first step in clearing her father’s name, at least in the public eye? Beyond the return of the self-contained revenge, the most intriguing thing about this week was Emily and Victoria teaming up to “help” Daniel, each doing it with her own agenda in mind. Some of the best moments of season one came when Emily and Victoria were forced into each other’s orbit, so them working together to achieve the same outcome (for very different reasons) is always welcome. The one slight hitch here is that—despite my praise for the streamlining of the Initiative mystery above—the purpose of all these shenanigans is still frustratingly unclear at times. This was a very pleasant episode to watch on an individual level, but fitting the Initiative storyline into the season-long narrative remains fuzzy at best. Is the Initiative planning something big again? And how does Aiden’s new relationship with Helen Crowley fit into the bigger picture? 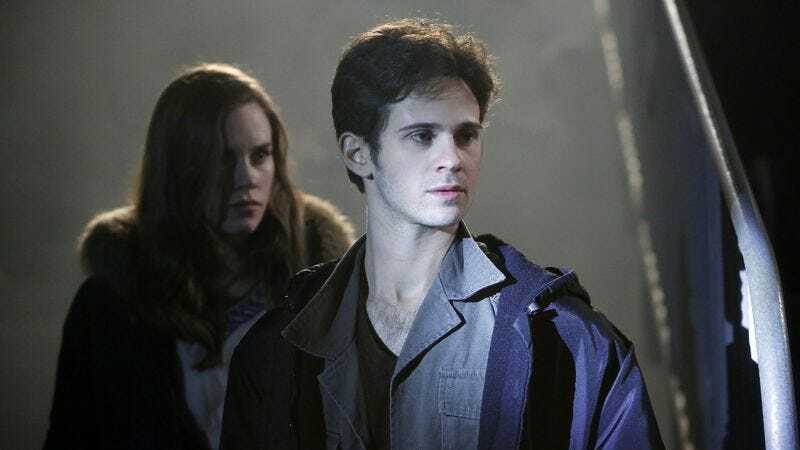 Learning his sister is likely still alive and under Initiative control gives him more to do (and a narrative drive that will certainly conflict with Emily’s, creating a good tension), and Helen getting more screen time as an actual face to this shadowy cabal remains promising, but keeping it relatively simple is key. Now, for the bad. After the winter finale, it appeared the show had made progress with the bar that ate the Hamptons, but after seeing the laughable turn the story took tonight, it’s just time to call it: This story is terrible, and it’s not getting better. Every time the narrative switches to Jack, Declan, and the Obviously Evil Brothers, it’s like a record scratch. The ridiculousness tonight topped everything that came before, with Jack’s attempt to get Kenny and Nate arrested for running drugs through the bar ending up as him getting framed for them instead. Jack (a character I actually enjoy, when he’s not saddled with the dumbest subplot of all time) and Declan are simply too stupid to root for at this point. With Jack now in jail, the only hope is that Amanda finally tells Emily what’s going on and she sets up some good old fashioned Emily Thorne revenge, ending this nonsense once and for all. For every horrible Jack and Declan scene, though, there’s something redeeming to balance it out. This week’s snarky stars were Conrad and Nolan, who were back in full force and acid-tongued glory. Conrad is stealthily becoming the MVP of the season, dropping perfect conversational barbs and generally strutting around like he doesn’t have a care in the world. Nolan also shone tonight, both in wardrobe and in wit, and looks to have a very compelling place in the future narrative as he works with Daniel at Grayson and against him at the same time. But as long as he keeps wearing double collars and yellow topsiders, anything else Nolan does is just gravy. Daniel is in charge but still feels like the ultimate patsy. He is destined to never be an active player in his own life, always controlled by forces he doesn’t recognize or even understand. This is the tragedy of being a Grayson. Emily and Nolan’s knowing smiles as they walk away from people in this episode prove they are kindred spirits. If Marco wants to reunite with Nolan so terribly, he probably shouldn’t have given Daniel the information that allowed him to take over Nolan’s company. Just a thought, Marco.